What a difference 1 year makes! I’m so proud and happy for my little swimmer. 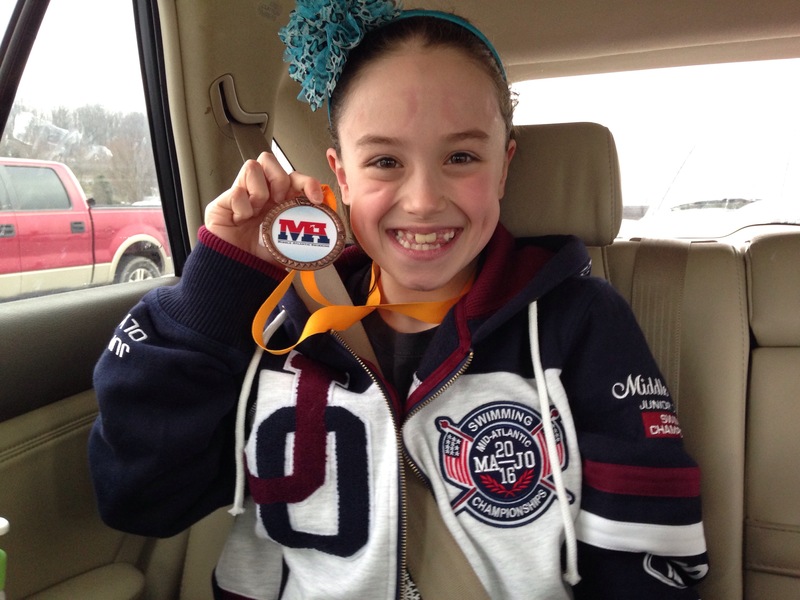 This past weekend Kenzie swam in her biggest most competitive meet ever – the Mid Atlantic Region Junior Olympics and did amazing! 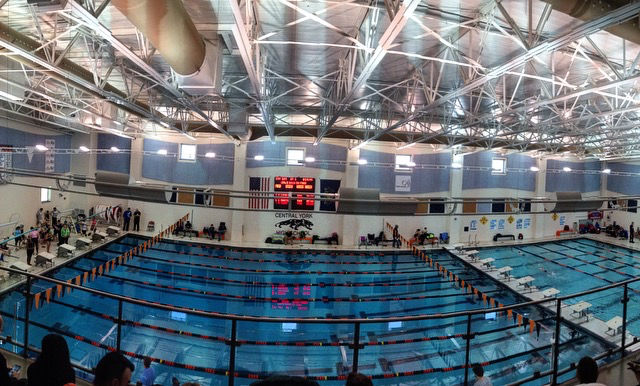 Swimmers from the states of New Jersey, Pennsylvania, and Delaware can qualify for the meet and then come together for a big championship style meet. The stars aligned for a wonderful day. 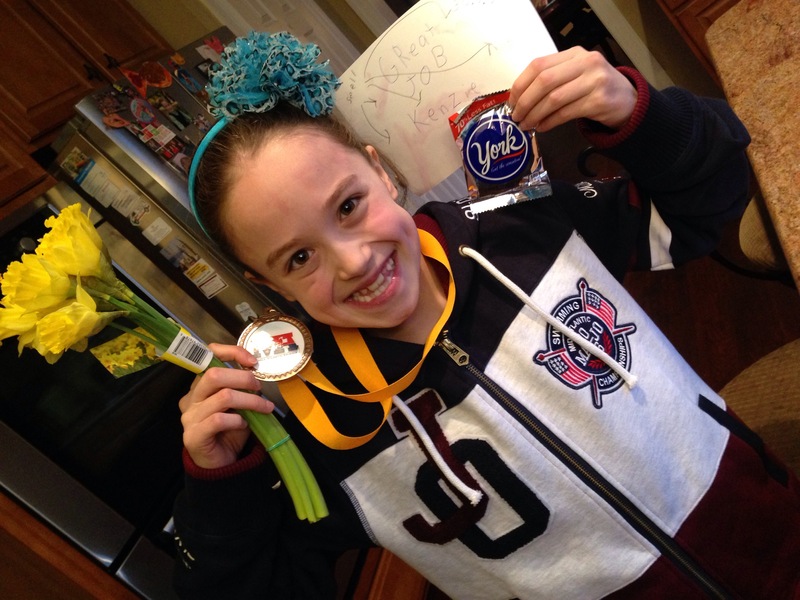 This time last year she missed this special Junior Olympic swim meet with a partially collapsed lung and pneumonia. She was so very very ill and I worried she wouldn’t ever make a full recovery. Lucky for her, with time, she healed and I am so thankful my girl is healthy today. She swam with heart & determination. She was stunned to medal! She grabbed 5th in 50 yard Fly at Junior Olympics racing a very speedy 30.53 for my friends who are swimmers as they’ll appreciate the time. Thanks to modern tech the boys watched the race live stream from home – and treated her to this York Peppermint Patty for her fast race in York when we came home. 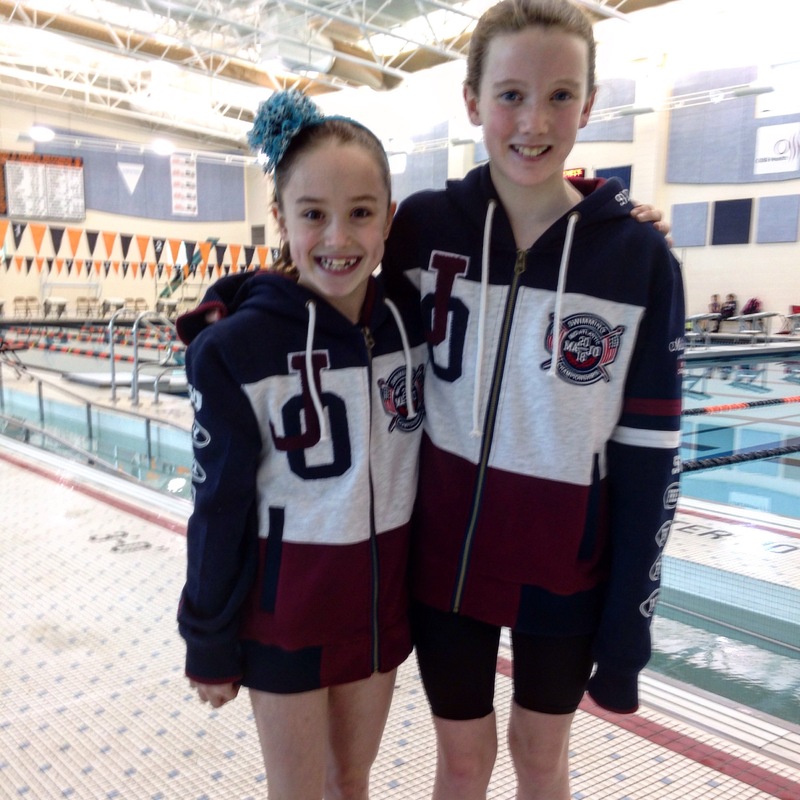 And beyond the awesome swimming, the highlight for all the Junior Olympic swimmers was this gorgeous sweat jacket. Since it’s an Olympic year it is extra fancy and special too! The kids receive it on the 1st day and can put all the events they qualify for on the sleeves along with their last name on the back. Very cool! Kenzie didn’t want to take it off and wore it over her PJ’s and to school on Monday! This is Kenzie and her teammate & best friend from our local YMCA – Maddie. Both girls swam amazing and got all their best times. 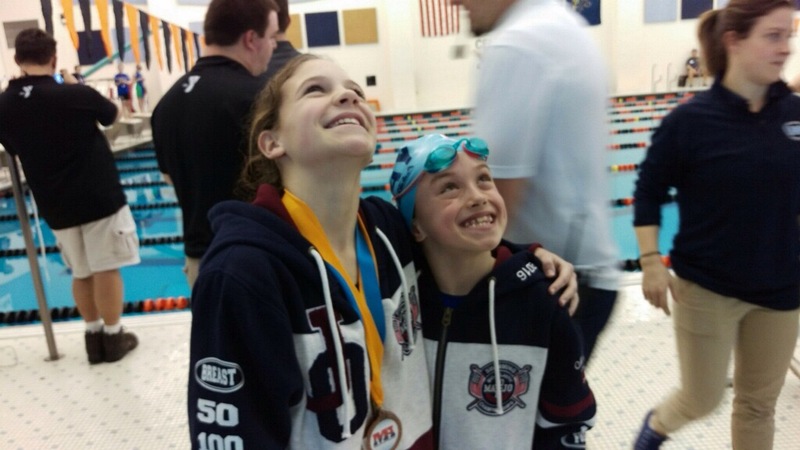 It was such a wonderful experience for them to just qualify for the meet and extra special to swim so well! Like a true swimmer she’s showing off her google marks on the car ride home and didn’t even take them off for her medal ceremony too! The other part that was really special and neat is that since so few kids qualify for the meet, most are coming solo or maybe with only 1 or 2 teammates. So it was a neat chance to make brand new swimming friends along with reuniting with old swimming friends she that she has competed with over the years. Here she is with her summer club teammate, Finley. These girls have been swimming together – and breaking relay records together – since they were 6 years old! Grabbing her medal during the awards ceremony. 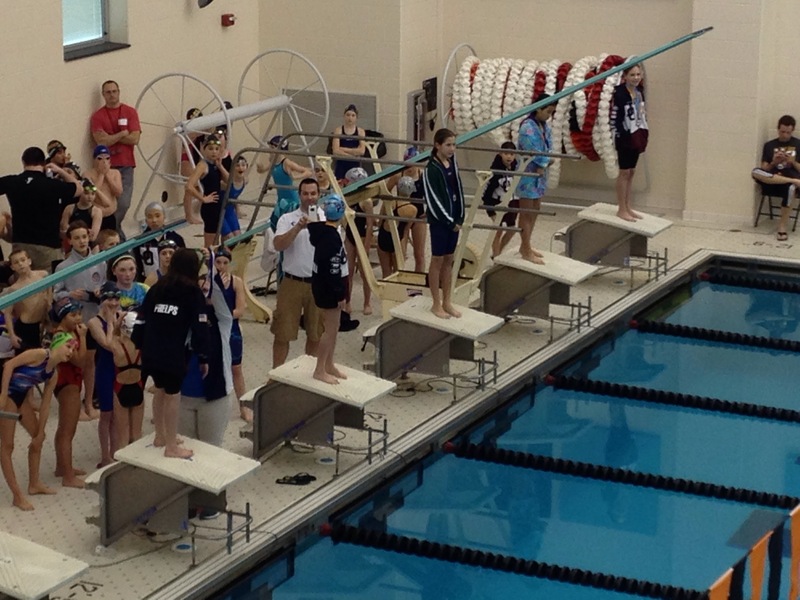 The top 8 swimmers are recognized on the starting blocks and given a medal.